New Hummingbird Species Discovered in Los Angeles County! 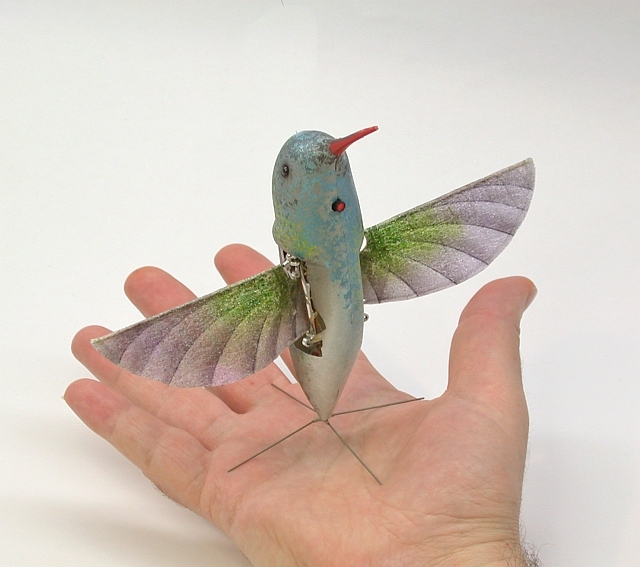 Astounding as it may seem, a new species of hummingbird has been discovered in the foothills of the southern slope of the San Gabriel Mountains. As yet, the only known location is near an industrial-residential section in the small town of Monrovia, where they have been filmed performing territorial flight displays. Tentatively classified as a member of genus Calypte, scientists assume they’ve previously been mistaken for their congener, the locally common and resident Anna’s Hummingbird, Calypte anna, although they bear only a superficial resemblance. DNA samples will presumably be taken. Nucleotide base pair analysis should reveal the bird’s closest affinities. Until results are released, final taxonomic classification cannot be ascertained with certainty. The tail – certainly one of its strangest characteristics – is the source for its probable English name, Four-wired Hummingbird. Despite the juvenile appearance of the pale plumage, at least one adult male was filmed in his courting/territorial display. Similar to the “J-shaped” flight of the Anna’s, it rises straight up to approximately 75 ft. above the ground. But – unlike the rapid descent and tail snap of the Anna’s – he then slowly descends and hovers directly in front of his potential mate (or rival). For a brief film of the mating/territorial display flight, go here. As no female or encroaching male was sighted, it is unknown which form of display flight this is. Actual mating has not yet been observed; nor have nests been found. Population size is unknown, as no more than two have ever been seen at any one time. The extent of their range also is unknown as they have never been recorded outside the immediate area of discovery. Local civic authorities are greatly excited by this unexpected fame. Discussions are underway to make it the official City Bird and put it onto their Great Seal of the City of Monrovia. Best of luck to any birder who goes chasing the bird, and stay off the peonies! The discoverer informs me that the perpetual motion pencil sharpener is “nearly done, just one or two tiny tweaks and it’ll be perfect, perfect!” (As all perpetual motion machines are, by definition.) It will then completely dominate the world’s pencil sharpening industry and You’ll Rue The Day you ever scoffed. Assuming, of course, that your comment was in reference to said machine. If not, ignore the above. I loved this! I read it with such enthusiasm and couldn’t wait to share the new with my husband… and then realized the date. Wonderful, thanks for making us laugh. Dear Hummer Discoverer Person — Don’t quit your day job. Food? : Etheric nectar for energy & virtualized gnats for protein. How? : Through that big red super-sipper. Dear Sir; you refer to “feeding.” Just what does it eat? And how?